Any ConHome reader worried about the modest tightening in the opinion polls should listen to a feature from Radio 4's indispensable Sunday night politics programme, The Westminster Hour, transmitted yesterday evening. Leala Padmanabhan's seven minute package revealed that confusion continues to reign within Labour as to how to attack 'David Cameron's Conservatives'. Listen to the package here. The idea that the party has changed too much and doesn't stand for anything anymore (Labour's Chameleon campaign). 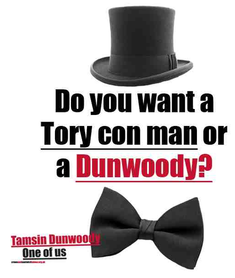 The idea that the party hasn't changed at all and is really the same old Tories. The idea that the party is just a party of Toffs. This tactic was tested most enthusiastically at Crewe and Nantwich and by John Prescott with his David Cameron is "just an ordinary lad from Eton" jibe. One tactic not examined within the report is Gordon Brown's "This is no time for a novice" tactic (a reheated version of the 'Cameron is weak' attack). Our guess is that that is going to look a lot less attractive if Barack Obama wins well in America. The independent academic Tim Bale (and regular ConHome contributor) who described the Conservative team as the "most gifted opposition" since Tony Blair. Dr Bale thinks Labour would be foolish to focus their attacks on David Cameron (eg as an estate agent) as they go against the grain of the electorate's view of the Tory leader: "The more they've seen of him the more they have liked him." Alistair Campbell said that the most important thing was that Labour rediscovered its zeal for attacking the Conservatives. He thought the Tories should be attacked for political cowardice and for not standing for anything serious. YouGov's Peter Kellner said that it was a mistake to attack the Tories for being policy-lite. Floating voters choose politicians for their reasonableness and competence. Kellner suggested that Labour makes the election about the instincts of the wider party, rather than David Cameron. I'm hoping to see Cameron leading a full scale attack on Gordon & Co soon as the economic situation will be the most important daily issue for the next few years at very least, but, in this we have a dilemma, George Osborne. Osborne's position as shadow chancellor means that he is now in the spotlight, but so far his performances have been decidedly lacklustre, frankly he's not that good a orator and doesn't command any real gravitas when on the screen apart from that ever present frown. From this disaster we have a massive opportunity to decimate Labour, but if we can't manage that then CCHQ has some major problems it has to address. Cameron is difficult to pin down, because he doesn't stand for anything. The electoral paint their own picture on him. It's like attacking a shadow. What the electorate will know right well is that Brown and his minions have been there for far too long. David Cameron is recognisable for not being Gordon Brown - a huge advantage. Brown's habit of surrounding himself with murky figures from the past and quoting distorted statistics are not endearing traits. The extent to which the public in general hate and mistrust such as the Baron Coy & Heartfool and Alistair Campbell cannot be underestimated. Was it appropriate for the BBC to be interviewing Alistair Campbell now he is back in Downing Street's pay? 'Modest', eh? So all of this - increased support for the incumbent party during the worst economic crisis in your lifetime (which they've substantially added to by their mishandling of it) - tells you nothing about the blatant fragility of Cameron's poll lead? Fair enough. Okay, so we probably all agree that Labour, pre-Mandelson, have been incoherent in their response to Cameron. Much as we were in our response to Blair in opposition. But was Blair in opposition 'incoherent' in his attacks upon on us? No, he wasn't. He was in fact - and utterly to contradict the tosh spouted by Kellner et al last night - relentlessly, personally negative about our then leader. And it worked. It always does. And that's the lesson, pre-Mandelson, Labour have failed to learn. That despite the fact that self-evidently the bulk of our poll lead was built upon slashing, personalised negativism towards Brown. Wait and see: Labour, post-Mandelson's return, *will* go after Cameron's biography, and it will work. This isn't a good thing, in what it says about either politicians or voters, but it is a true thing. I agree that there is great mistrust of Alastair Campbell, but even more that probably the scribes are no longer afraid of him. In office with Blair, he could bully his way over everyone but not now. I think the turning point for how he is perceived came at that appalling press conference he held after the Hutton decision. The pack waited where - somewhere with golden furniture, and there was something peculiar about the speech, I remember thinking he was going to blast everyone, to crow, and he did not - and in the end it was a speech signifying nothing - afterwards one wondered why he had bothered, and why he was frightening. Well he is not now, he might have cunning plans in the background but I think today's scribblers have got a bit more backbone. More than that, media communications and blogging have changed things a world away from when he was doing his stuff. I think the subject of this thread demonstrates just how UNFIT Labour is, and this government in particular is, to manage adequately an over-crowded country like ours. Why am I saying this, because always and ever, their first consideration EACH DAY, is about getting back into power - and staying in power for ever. Mr. Brown has just enlarged his staff considerably - why? to run the country more efficiently? I think that is unlikely, as many people have noted before this government has already enlarged the public sector in the form of quangoes and agencies, who are there presumably to help government! No, Mr. Brown's enlarged staff is just evidence of how determined he is to eradicate ANY competition to his rule!! LibDems please note! I think the Tories need a heavyweight leadership team in place now to take on Gordon Brown. As someone who has campaigned with John Redwood over the last few years, mostly in the run-up to the last general election, I think he is our answer to Gordon Brown, at least as far as a credible chancellor goes. Who is our answer to Tony Blair is another matter, and unfortunately if the "modest tightening in the polls" is anything to go by, and it gets worse not better, the answer is not David Cameron. The Draper/Campbell rebuttal unit are so busy. Who does pay them? Am I, as a taxpayer, subsidising this propaganda machine of despicable low lifes and warmongers. I would also like to know how these has-been spinmeisters gagged David Kelly's family. ACT et al should look long and hard at their miserable and souless existence. There will be a reckoning and possibly the best night of my life when I sit up on election night, huddled round what little heat I can afford, sipping a can of cheap but heavily taxed beer, probably in the dark. Unlike these champagne socialists and their gangster cronies, mosy of us will rejoice to see the end of the totalitarian dogmatic, lying grip these b***tards have on the UK just now. That is assuming that an angry bloodthirsty mob has not at last woken up before then. Finally, when will somebody take campbell to task for his lies and spinning of us into war? How much has that cost so far Ali Bloody Campbell. That is a very satisfying post M.Dowding!! If I was a labour supporter I would have to attack the party for its lack of experience and its front bench which looks like an Eton in club. “Dave and his cronies, have no idea how real people live”. Then of course there is the fear factor. “The Tories are going to get rid of tax credits”, “They will cut benefits for the disabled” and “ They will cut tax’s for the rich and make the poor pick up the tab”. Boris “the in clubs comic has already started as they mean to go on by cutting reduced fairs on London transport for those on income support” , “so now they have to get on their bikes to find work” I don’t think it’s a case of Labour not having decided how to attack the party its more a case of keeping their powder dry for later on. As it is the front bench needs some serious pruning. There is a real need to understand how unlikely the current bunch have of getting us elected most especially as they have so few real convictions between them.Can we have some real people in your cabinet Dave ?